I love L’Oreal products. Few months ago they launched exquisite and designer range called the L’Oreal Infallible Range. Today I will be reviewing the most popular shade from this range. 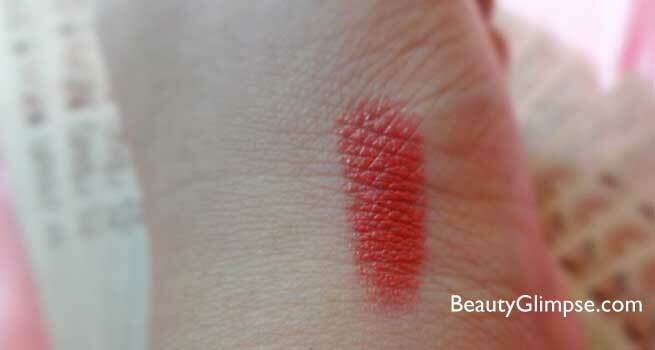 It’s one of the most wearable oranges I have come across and it’s a dawn to dusk shade. I think all you ladies should go for it. Want to know why? Keep on reading the review. Directions of use: start applying from the center of the lips. For a more defined look use a lip liner of the same color. Layer more for more coverage. Infallible Le Rouge stays fresh and vibrant looking for up to 10 hours without feeling sticky, tacky or dry. Enriched with Vitamin E for moisture and Ceramide 5 for conditioning, Infallible Le Rouge applies evenly without flaking or fading out. 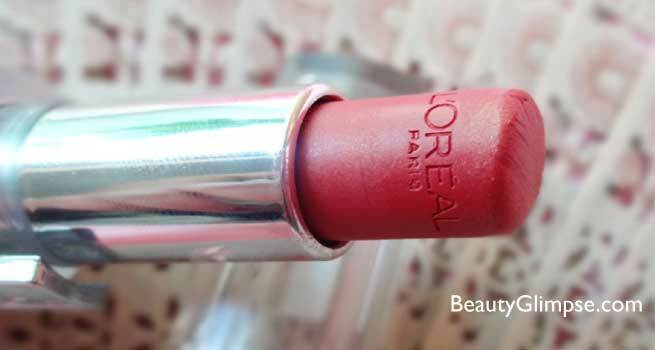 The new Infallible Le Rouge formula is based on L’Oreal’s Colour Bond Technology that features a flexible network that captures and fixes colour on lips. This is made possible by an association of adhesive polymers that allows for the longevity of the lipcolour, as well as silicon micro spheres that ensure only the richest lipcolour will be left on a woman’s lips. The lipstick comes in a silver tube with a plastic cap. 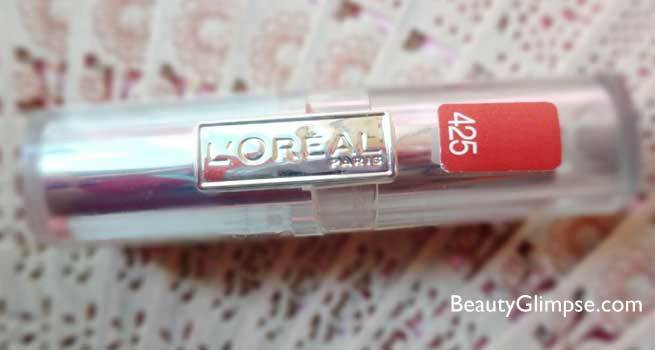 It has L’Oreal written in silver inscription on the body. The shade number and the color and the name are mentioned at the bottom of the bullet. This makes it easy to spot and store the lipstick. 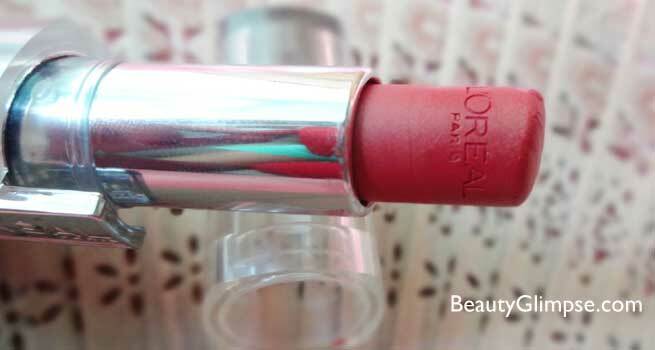 The bullet also has L’Oreal inscribed in it and overall gives a very luxury feels to it. The cap closes securely and the entire packaging is quite good. The color of the lipstick is perfect peach with pink undertones and subtle fine golden shimmer. The shimmer is not at all frosty and it helps gives a dimension to the lips rather than make them shine out of the box. The texture is butter smooth. It glides on easily but if you have extremely dry lips I would recommend using a balm underneath. The color is very warm and can be built up using multiple swipes. The color “always apricot” is true to its name. I am in love with this color and I wear it every day. One swipe is quiet decent and gives a good coverage unless you have heavily pigmented lips. This lipstick can go well with Smokey eyes and as well as with heavy makeup. The shade is very flattering to the Indian skin tones and gives it a very glow look. It’s not moisturizing at all and it doesn’t stay for 10 hours as it claims. You can count on it for 5 hours at the max after which it will leave a nice tint behind. Overall I think this is a very good buy and one should definitely try it out once. Festive as well as regular use.